For too many Americans, a “quick trip” to the grocery store isn’t an option. In neighborhoods that lack access to grocery stores, many residents rely on small corner stores and bodegas for most of their food purchases. These small stores often sell predominantly processed, unhealthy foods, and carry little or no fresh produce. To increase access to healthy foods in these neighborhoods, local governments have experimented with either incentivizing these stores to start carrying healthy foods (as in Washington, D.C.) or enacting licensing policies that require these stores to carry a certain amount of healthy foods (as in Minneapolis). One of the biggest challenges to successful passage and implementation of healthy corner store policies is resistance from corner store owners who perceive these policies as a significant economic burden. Most corner stores are operating on thin profit margins as it is, and in many communities they’re competing against lucrative fast food outlets. Why don’t local governments stick to restricting these large corporations rather than going after small business owners? If the goal is to improve the well-being of a community, shouldn’t we support local business rather than increasing the hoops they must jump through to stay in business? For corner stores to profit (and for consumers to benefit), the stores must offer foods that appeal to community members. In some neighborhoods, shoppers might be willing to purchase and cook fresh, whole fruits and vegetables if they are available and affordable. In other neighborhoods, knowledge of food preparation is lower and consumers are looking for ready-to-eat foods like sliced fruit, salads, or yogurt. And of course, this will only be effective in neighborhoods where there is an actual dearth of existing fresh food markets. New York City’s Healthy Bodegas Initiative focused on bodegas in Brooklyn, the Bronx and Harlem because these were the predominant food outlets in these neighborhoods and offered very few healthy options. For example, leafy green vegetables were only offered in 2 to 4 percent of bodegas in Harlem. The implementing city agency should assist stores with small pilots of various types of food that will help stores gauge what will sell in their neighborhoods, and they can scale up on the type of foods that are more popular. One large hurdle to effective implementation is that many small corner stores do not have refrigeration units and are not used to culling produce that is bruised or overripe. A city government implementing a healthy corner store policy should provide technical and financial assistance to stores, such as loans and grants for infrastructure improvements, and trainings on how to display produce. Some stores have had success with displaying fresh produce outside the store on the street, which attracts customers to purchase both the produce and other items in the store. Stores could also offer grab-and-go items like bananas, sliced apples and nuts near the checkout counter. To estimate the expense involved for a city government, Minneapolis paid one staff member for 20 hours/week of work, and contributed $400 per store for initial signage and display costs. Given that low-income populations are the most likely to be unable to access and afford fresh produce, a successful healthy corner store policy should focus on addressing the needs of these consumers. The implementing city agency should assist corner stores in applying for authorization from USDA to accept SNAP benefits (or food stamps). To be able to accept WIC (federal food assistance for Women, Infants and Children), a store must carry fruits and vegetables, whole grains, low-fat dairy products, and other healthy foods (requirements vary by state). The implementing agency should help stores to start offering these foods and to become WIC-certified. In California alone, WIC participants receive $1.1 billion every year to spend at food retailers. This has the potential to lead to a large increase in sales for healthy corner stores. Another challenge to corner stores carrying fresh produce is that they often cannot purchase enough produce to qualify for wholesale prices from distributors. Corner stores’ relatively small purchasing needs make them ideal customers for local, small-scale farms, which often have trouble selling to large retail outlets because they do not grow enough to meet their needs. Not only does buying locally benefit the store owner, who can offer fresher food that has a longer shelf life and better taste, but it also further strengthens the local economy by increasing profits for local farms. These farmers in turn invest in labor and equipment from other local retailers, keeping the money within the community. Local food advocates and the implementing agency could also consider developing a food hub as seen in St. Louis, where locally-grown food is aggregated and sold to corner stores and other food retailers at whole sale prices. Depending on the region of the country, one challenge to purchasing locally can be the limited growing season. The implementing agency should be ready to assist corner stores with finding alternate distributors to ensure consistency of offerings when locally grown food is not in season. In addition to purchasing locally, store owners can think creatively about sourcing low-cost healthy foods and increasing their profits. Farms are often willing to let “gleaning” organizations harvest the extra produce off of their fields after they have done the initial harvest for their primary buyers. This produce is often perfectly good, with perhaps slight bruises or abnormal shapes, and can be sold at a discounted price. Similarly, unsold food at the end of farmers markets is often thrown into the compost pile back at the farm, even though it’s perfectly good to eat. These farmers might be happy to sell to corner stores at a reduced price. While the food might not look perfect enough to sell in its original form, crooked carrots and cucumbers can be sliced into smaller pieces, and apples can be peeled and sliced. This ready-to-eat food can even be sold at a slightly higher price than in its whole form. Profit margins can be more than 100 percent for prepared healthy foods like sliced fruit or salads. This processing can be done by the farmers, or by a middle-man distributor for a cost. Another option is that store owners can support the sale of healthy foods without being responsible for storing them. In Eugene, Oregon, one corner store chain in low-income neighborhoods hosts a farm stand outside their stores during the summer. Another option is for the corner store to act as a CSA (Community Supported Agriculture) pick-up location. This increases foot traffic in the store, likely leading to increased purchasing, without the store owner taking responsibility for storing the produce. Healthy corner store policies can significantly increase access to healthy foods in communities that currently lack access to this basic need. Yet these policies will only be effective to the extent that policy makers invest sufficient resources and task the implementing agency with technical and financial assistance to ensure that small businesses reap the benefits rather than the burdens of these requirements. Increasing access to healthy fresh foods for low-income communities is essential for improving the country we live in, and should be thoughtfully implemented to strengthen and empower the entire community. *This piece was originally published on the policy blog Bridge 50. Does this Outfit Make Me Look Healthy? Today, New York opens its runways for the first Africa Fashion Week, bringing the work of emerging African designers to the catwalk, and showcasing a growing industry that bridges a gap between a poverty stricken continent and one of the most profitable consumer bases in the world: the woman’s closet. Designers are already exploiting the beauty of the African continent: the producer of this week’s shows reports photographing African styles in American stores to inspire her Nigerian relatives to seize this movement. Bringing African designers and manufacturers into the fold of this booming industry will open doors to economic prosperity and creative outlets. Yet Africa Fashion Week symbolizes more than economic opportunity and the globalization of design. Turning attire into a commodity serves as a reminder of the darker side of fashion: the direct impact that the industry has on models, as well as the surrounding culture. New markets often introduce public health challenges (e.g., the globalization of tobacco and food industries has contributed to the spike in prevalence of non-communicable diseases). Clothing seems innocuous, but when coupled with a powerful industry that drives expectations, women are suddenly faced with new, and not necessarily healthy, norms. Indeed, wherever apparel has become a commodity, fashion has made enviable what was previously undesirable: dangerously (sometimes fatally) thin women. While the causes of eating disorders are many and complex, the image of a woman is undeniably a contributing factor. When emaciated women are displayed as the epitome of beauty, grace, and style one day, and are deceased the next, attractiveness is paired with disease, and health is out of style. The fashion industry not only shifts perceptions of beauty, but also drives its employees into the ground, literally. Models are forced to choose between unemployment and dangerous standards of appearance: a woman (or girl) must be at least 5’9’’ to sign with most agents, and must fit into a designer’s sample size to walk in a show (generally a 00). If the outfit doesn’t fit, the model is out of work. The President of the Council of Fashion Designers of America (CFDA) concedes that sample sizes have trended downward, leading agencies to hire increasing numbers of adolescent girls. As these girls mature into women, they must either endure starvation (self or drug induced), or quit. Like other ambitious professionals, most shun the latter. Individual models (literally at death’s door) have spoken out against this fatal trend, but designers have adamantly resisted change. Only a few small players have implemented rules to protect models from starvation: women participating in fashion weeks in Madrid must maintain a BMI of at least 18 (about 12 pounds heavier than the average 5’9’’ model), and those participating in Milan’s shows must obtain medical approval. Larger industry associations have resisted pressure to impose health standards, refusing to “interfere in the aesthetic of any designer’s show.” For example, rather than follow the lead of Milan and Madrid, the CFDA has implemented a vague and toothless health initiative, “encouraging” models to seek physical and mental health attention, and hosting discussions on the importance of raising awareness. Concrete actions are conspicuously absent. Legislators must step in. Industry’s voluntary guidelines will never be sufficient: an agency’s requirement that a client maintain a given BMI will not prevent designers from selecting other models based on a single sample size, and starving models will always be able to find an agent who will not insist on weight gain. Instead, to protect the health of these workers – and of the population at large – the law must intervene. The Occupational Safety and Health Administration (OSHA), created to secure “safe and healthful working conditions” for “every working man and woman,” could invoke the Occupational Safety and Health Act’s general duty clause to require the industry to mitigate this known hazard (e.g., by prohibiting designers’ use of runway models with BMIs under 18, and requiring models to produce evidence of annual physical examinations). To prepare for such enforcement, the National Institute for Occupational Safety and Health (NIOSH) should study the issue and release guidelines for OSHA to act on. Charged with recommending occupational safety and health standards (including for psychological health), NIOSH is well positioned to examine this workplace hazard. Indeed, it has responded to Congressional requests to investigate similar concerns in other domains. The industry, having belittled BMI as a faulty indicator of health, would undoubtedly challenge such enforcement activity. Its legal arguments, however, would be weak. For example, a model may file an employment discrimination action, asserting that her right to medical privacy protects her from a contract contingent on either weight or submission to a physical examination. Yet a model’s contract inherently hinges on appearance; agents have already established that it is a business necessity to employ specific body types. A constitutional challenge based on the right to freedom of expression would similarly collapse. While a designer may have the right to depict clothing on a woman of any figure (e.g., in photo spreads), this right does not extend to forcing the woman to actually acquire or maintain an excessively low bodyweight, simply to achieve an incompatible height-weight combination. Needless fatalities are not tolerable costs for any workplace, creative or otherwise. Today, as African models don emerging designers’ work and step onto the runway, we are reminded of both the beneficial and injurious effects of globalization. The opening of the first Africa Fashion Week provides us with an opportunity to both reflect on the deadly toll of the industry, and to reconsider how the law can begin to reverse the craze that has contributed to the lethal obsession with rail-thin women. *This blog was originally posted on the O’Neill Institute for National and Global Health Law blog. As Menino steps down and Marty Walsh prepares to take office, Boston food advocates are uncertain how – or if – Walsh will continue and expand upon Menino’s impressive food policy legacy. Walsh, who ran on a labor and education platform, refers sparingly to food policy issues on his website and in interviews. Yet food policy aligns well with Walsh’s platform, and he should use Menino’s efforts as a springboard to further invest in improving Boston’s food system. The following is a list of some of Menino’s top achievements in food policy and some suggestions for how the new Walsh administration can keep this legacy strong. 1. Creating the Office of Food Initiatives. 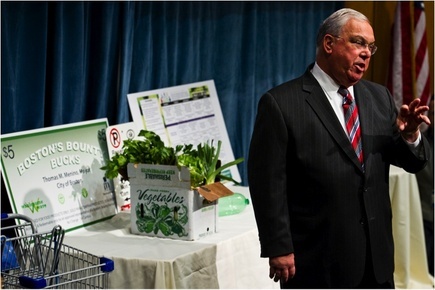 In 2010, Menino created the first Boston Office of Food Initiatives (OFI). OFI works with the Boston Food Policy Council, a group of advocates from the government and non-profit sector, to meet Menino’s directives, which include: (1) increasing access to fresh, affordable foods, (2) expanding Boston’s capacity to produce, distribute, and consume local food; and (3) building a strong local food economy. OFI played a key role in implementing many of the policies described below. 2. Opening grocery stores in food deserts. At the outset of his tenure, Menino pledged to open more grocery stores in low-income neighborhoods where residents lacked access to stores with fresh produce and healthy options. 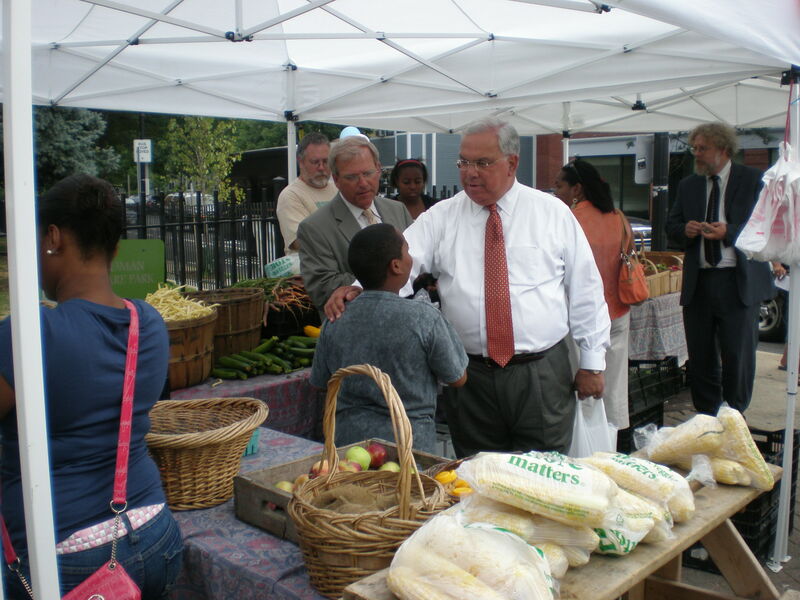 Since then, Menino has aided in opening 26 grocery stores in urban areas of Boston. Specifically, Menino has used American Reinvestment and Recovery Act (ARRA) and city funding to catalyze the opening of grocery stores, such as the Foodie’s Market in South Boston, which opened last February. Yet large parts of Mattapan, Roxbury, and Dorchester are still identified as food deserts according to the USDA Food Access Research Atlas. Investment in new innovative models of bringing affordable food into these communities is still needed. 3. Banning soda from schools and all city property. In 2004, Menino banned sodas from Boston public schools in an effort to curb childhood obesity rates. Sugary drinks like soda increase the risk of obesity, diabetes and other chronic diseases. Given that these schools received funding from the soda companies, Menino’s policy met resistance from teachers, parents, and principals. But the ban seems to be working. Two years later, high school students reported drinking significantly less soda. In 2011, Menino went a step further, banning the sale, promotion, or advertising of soda on city property. 4. Doubling SNAP Benefits at farmers markets. Menino co-founded the Boston Bounty Bucks program with the Food Project in 2008. Now administered by the Boston Collaborative for Food and Fitness, the Bounty Bucks program offers a dollar-for-dollar match up to $10 for individuals using their Supplemental Nutrition Assistance Program (SNAP, formerly food stamps) benefits at farmers markets every time the shopper visits the market. The program has grown rapidly, and in 2012, 18 farmers markets in Boston accepted Bounty Bucks, generating additional revenue of $170,000 for those markets. This program is important both to support local producers and also to make fruits and vegetables more affordable for SNAP participants. 5. Promoting urban agriculture. In 2010, Menino appointed the Mayor’s Urban Agriculture Working Group to assist the Boston Redevelopment Authority in creating new zoning laws that authorize urban agriculture. The groups collaborated to craft Article 89, which allows farms up to one acre to open and grow food in any part of the city (among other measures). If adopted, Article 89 will increase access to fresh produce for city residents, create jobs, and promote innovative models of food production, such as the Higher Ground Farm on the roof of the Boston Design Center in South Boston. While Article 89 will be a huge step forward, urban farmers will still need significant assistance from OFI to navigate through the complicated process of opening and operating their farms. 6. Backing food trucks. Menino worked closely with the City Council to pass the Mobile Food Truck Ordinance in April 2011, which authorized food trucks to operate on Boston streets. In just two years, the number of food trucks in Boston has expanded from 15 to 59. Food trucks have added over 100 jobs to the Boston economy, both to staff the trucks and then to staff the brick and mortar restaurants that some trucks open after their initial commercial success (including my personal favorite, Mei Mei Street Kitchen). Food trucks bring Bostonians out into the streets to eat communally in green spaces and sidewalks around the city. The Mayor’s Office, through OFI, continues to support new food truck entrepreneurs, providing training and guidance to help them through the permitting process. 7. Establishing universal free school breakfast and lunch. This school year, all Boston public school began to offer free breakfast and lunch to all students regardless of income level through the “Community Eligibility Option,” a federal program also in effect in 10 states and D.C. The Community Eligibility Option removes the qualifications required for reduced and free meals and thus eliminates parents’ burden to complete paperwork, removes the stigma associated with eating free meals, and streamlines the administrative process. In addition to these benefits, universal breakfast improves attendance, and leads to students being more attentive and engaged. First, Walsh should maintain OFI and its staff, who have been instrumental in putting Menino’s food policy directives into action. Walsh should capitalize on the existing infrastructure Menino created to move food policy forward, and continue to use these critical resources. Second, Walsh should prioritize further decreasing the number of food deserts within city limits by promoting both permanent grocery stores and mobile grocery stores. Simultaneously, Walsh should invest in infrastructure improvements, such as refrigerators and coolers, to enable corner stores to carry fresh produce. Third, Walsh should further protect children from unhealthy foods during the school day by advocating for a zoning ordinance banning fast food outlets from 500 feet around public schools, following the lead of Detroit. Consistent with Walsh’s campaign goal to improve public education in Boston, ensuring that students learn in a healthy environment is an integral component to meeting his goal. Walsh seems to take pride in Boston’s reputation as a hub for innovation, and he should realize that innovative solutions to food and agricultural problems are essential to the future economic viability and livability of our city. Finally, Walsh must recognize that access to healthy food for all Boston communities will strengthen our workforce and improve educational outcomes, and thus is integral to achieving the goals on which he campaigned. The Food Law and Policy Clinic hosted the panel event “Waste Not Want Not: How We Can Use Food to Feed People Instead of Landfills.” View the event summary and video. Read the press articles about the event and issues. National Journal: Are Insurers Finding a Way Around Obamacare Preexisting-Conditions Protections? The Affordable Care Act prohibits insurers from denying coverage to individuals with preexisting conditions, but some companies may be limiting their prescription-drug offerings to steer HIV patients to other plans. “We’re seeing policies in place by insurance companies that certainly look like they are intended to make plans look less attractive to patients with HIV,” said John Peller, vice president of policy at AIDS Foundation of Chicago. …Advocacy groups are observing this across a number of major insurance companies in a large number of states. The HIV Health Care Access Working Group (HHCAWG), a coalition of national HIV health policy advocates, has sent letters to insurance companies and to Health and Human Services Secretary Kathleen Sebelius regarding the issue. “We’re making sure that formularies are robust, and [insurance companies] are not utilizing management techniques—like tiering or prior approval—that create unfair or undue burdens on people to meet their standard of care,” says Robert Greenwald, director of the Center of Health Law and Policy Innovation at Harvard Law School, and a cochair of HHCAWG. Greenwald is the main individual behind the effort, and point person on the letters. The Center for Health Law and Policy Innovation of Harvard Law School and The Treatment Access Expansion Project (TAEP) are proud to release the State Healthcare Access Research Project (SHARP) Massachusetts Hepatitis C (HCV) Report. Developed in close collaboration with our community partners in Massachusetts, the report is an analysis of the successes, challenges, and opportunities for improving healthcare access for individuals living with hepatitis C. It highlights successful policies that facilitate HCV prevention, treatment access and retention in care, as well as persistent challenges that remain, even in Massachusetts’ post-reform health care delivery environment. Finally, the report provides recommendations for law and policy reform, offering examples of best practices from other states and other models for promoting access to high quality and comprehensive HCV prevention, care, treatment and services. (See the Executive Summary).